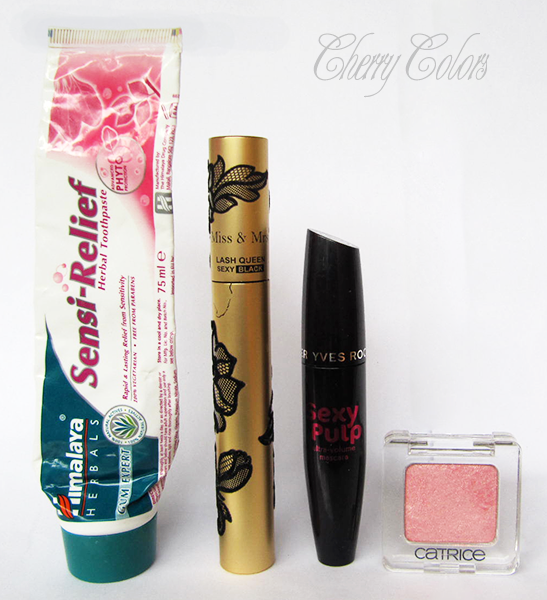 Empties #7 - Cherry Colors - Cosmetics Heaven! 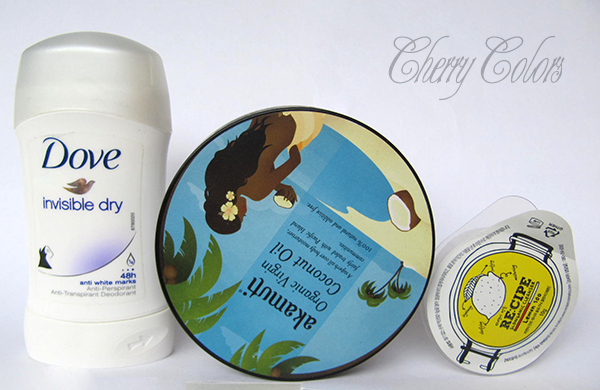 I am very excited to show you which products I managed to use up lately. Some were a miss, but some were a hit when it comes to usability. Let's start with the first photo. Well... the name is nice and the scent is neutral enough. However, it gave me painful cystic acne on my armpits. Oh boy, the pain! It worked, yes... not sure about the invisible part, I seldom wear black shirts. But if it weren't for the painful little detail, I'd totally use it again. A wonderful product, about which I wrote here. I loved every inch of it and I hope I will be able to repurchase it in the future. Oooooh.. The scent and the texture. Boy, I loved it. The scent is this gentle a bit sweet lemon. Not overpowering and fresh enough not to tickle my senses. The texture is like dipping your fingers in a cloud. So gentle, spongy, smooth.... and I am not even kidding. Just remembering makes me happy. Sadly I used it up in a week and cried my soul out. It didn't dry my skin out, my skin was actually HAPPY after using it. AH. It is too expensive for me to purchase the full size ($40!! ), so... goodbye great cleanser. Repurchase? I would if I could. Ok, enough of self-pity.. lets move on the next part of the empties post. I bought this toothpaste because a fellow blogger said she likes this brand. And because she tried the one I recommended. It is nice, it doesn't foam that much and the teeth feel very clean after using it. However the taste is something that takes a little bit of getting used to - it is a bit salty? A good toothpaste for when I get bored of my staple (Ajona, if anyone is curious). Repurchase? Yes, maybe a different type. I did a short review of it here, and I have nothing new to add. I like to try new mascaras and this one was Okay, nothing too special. I don't think I ever wrote anything about it, but I used it here and here. It did its job well, nothing too fancy (except the price). Made my lashes look all natural ;). I really like the sleek package, but I wish it would give me more volume. I mainly bought it because I thought it would make a great blush. It kind of does, except it's not very pigmented so more like a highlighting kind of a blush. Lovely. Except it is an eyeshadow. Not as pigmented as I'd hoped, but nice anyway. Anyway, I completely forgot about it (put it away in my mineral eyeshadow box.. don't know why exactly) and it expired. Smells funky, so off it goes. I am a bit upset about it, but what can you do.. sometimes life turns this way. Repurchase? Not really, I rarely buy single eyeshadows (because as we can all see I lose them or forget about them). Which products are you running out of this month?